Browse dialog operating on shell namespace. Definition at line 947 of file shellclasses.h. Definition at line 949 of file shellclasses.h. 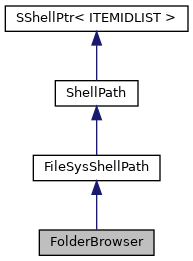 Definition at line 964 of file shellclasses.h. Definition at line 969 of file shellclasses.h. Definition at line 975 of file shellclasses.h. Definition at line 976 of file shellclasses.h. Referenced by FolderBrowser(), and GetDisplayName().